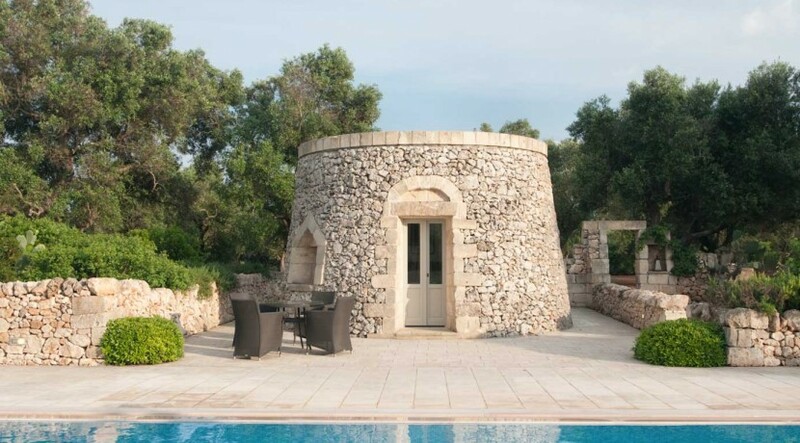 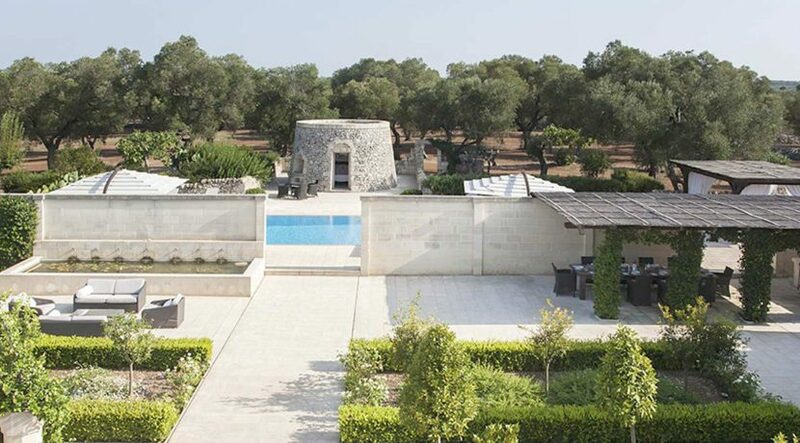 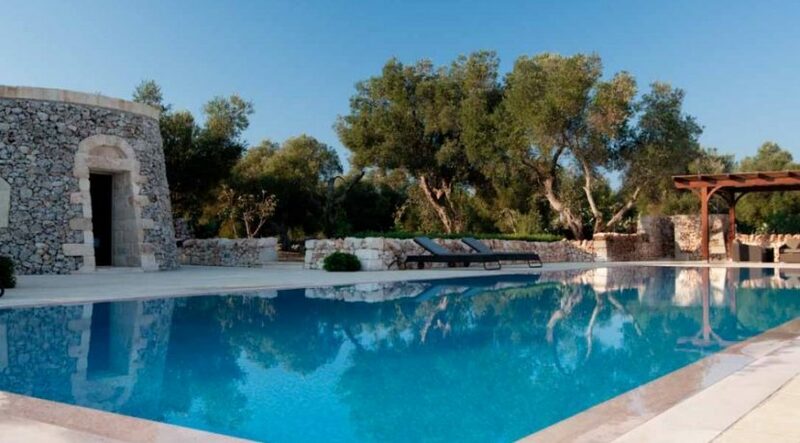 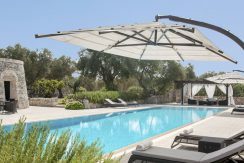 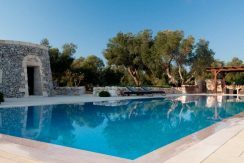 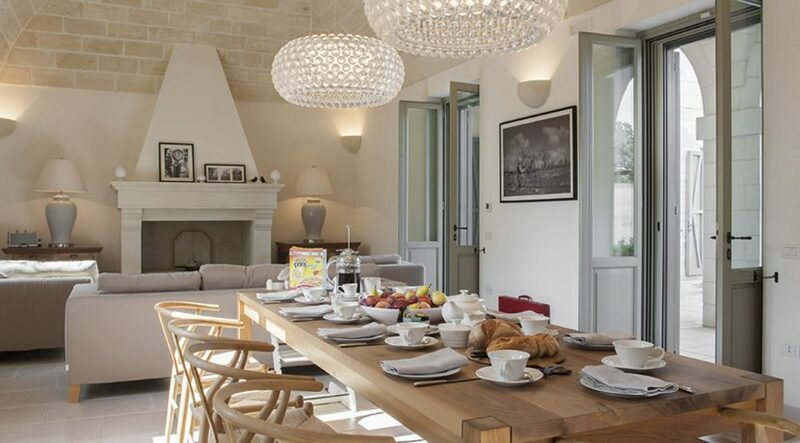 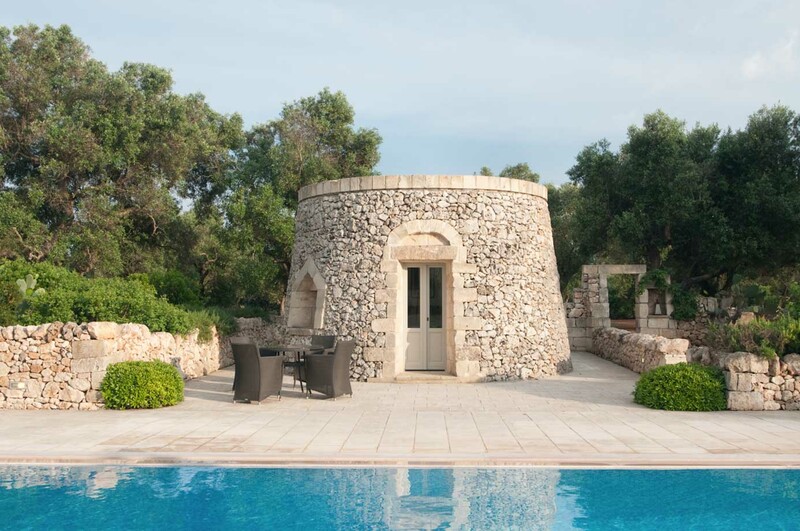 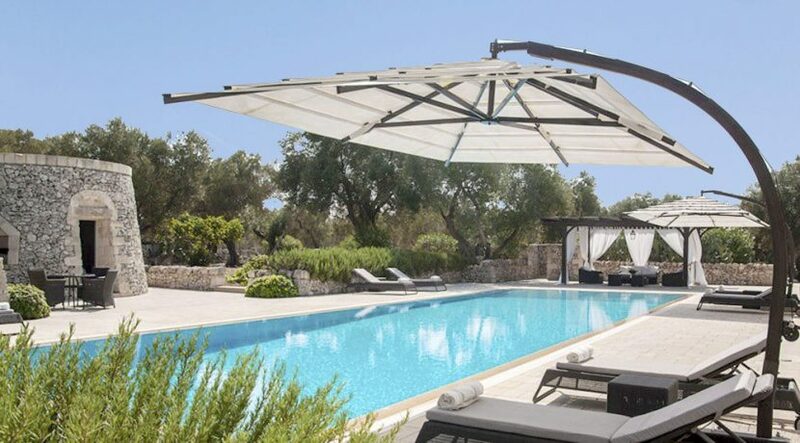 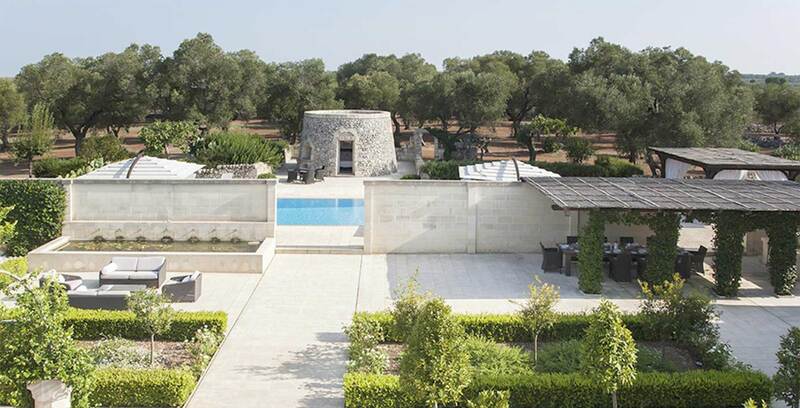 This stunning luxury holiday villa is set in over two hectares of ancient olive groves and has an enchanting Furneddu (Trullo) guest house at the pool side. 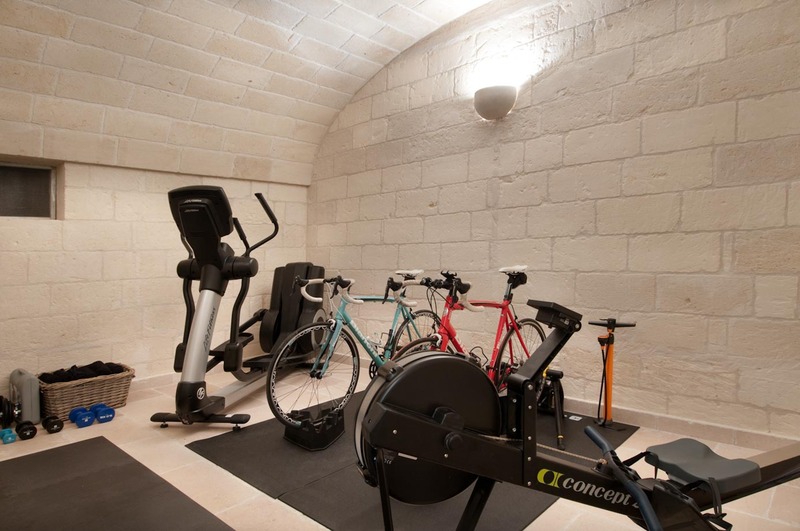 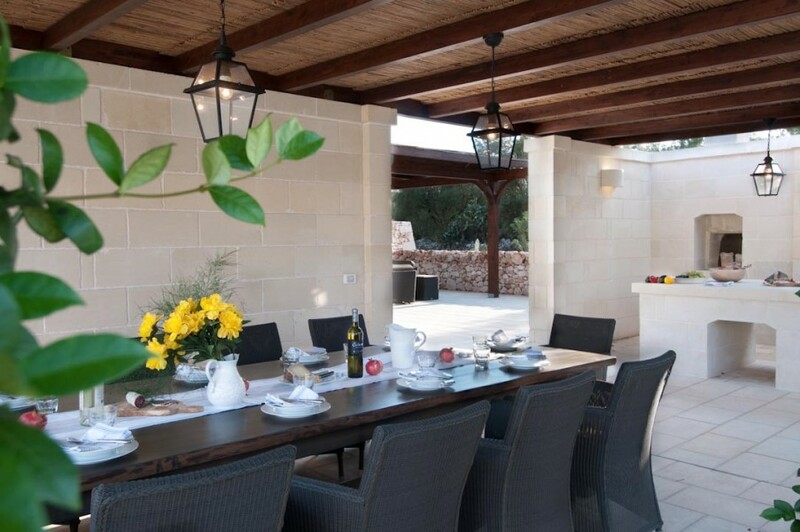 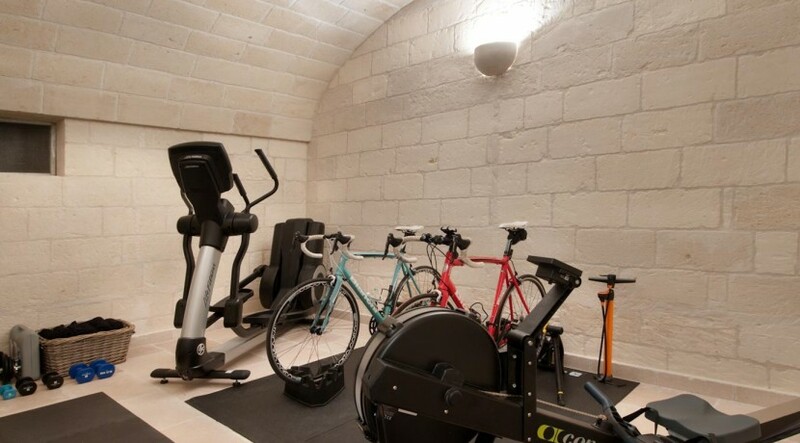 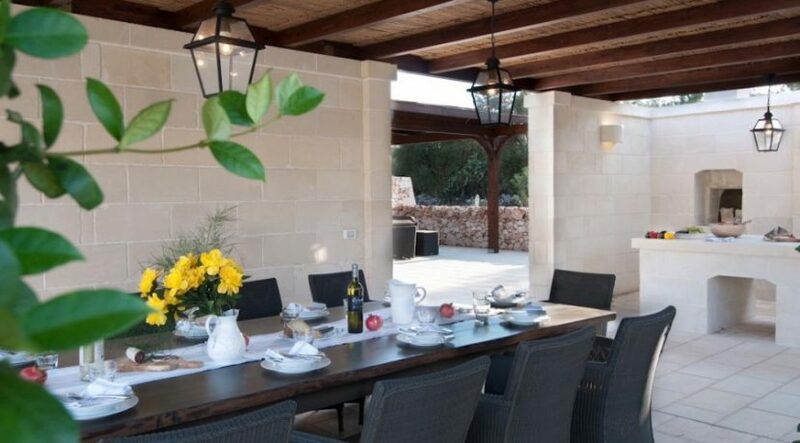 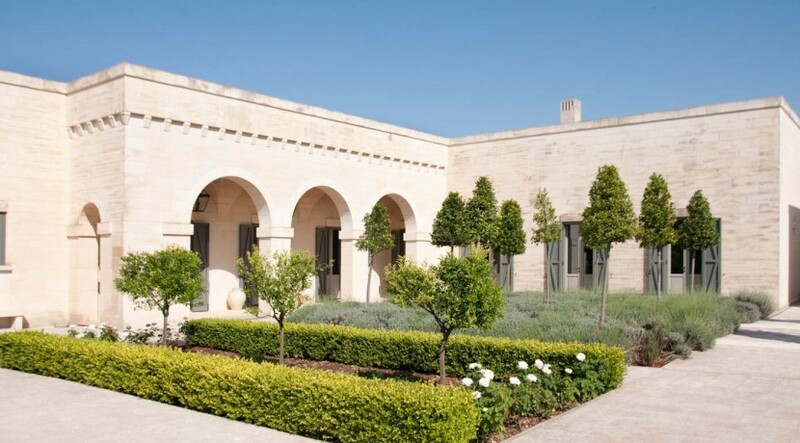 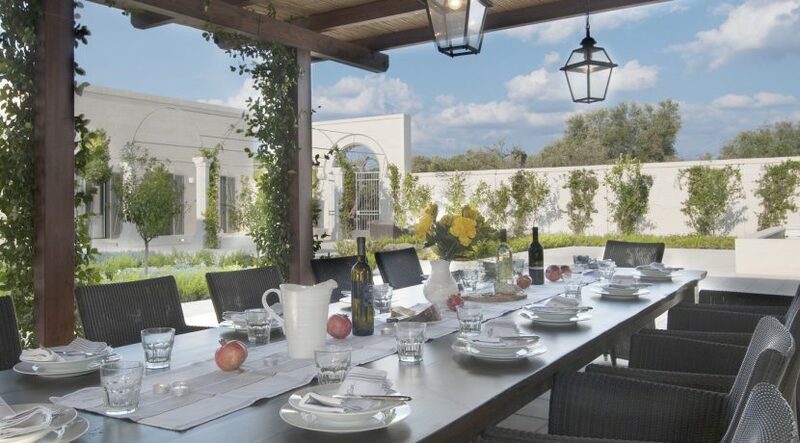 This Puglia villa is a wonderful blend of the old and the new which appeals to the luxury international market. 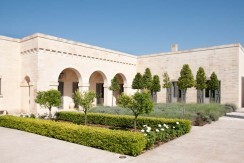 The design of the building and surrounding space has been meticulously crafted to create a beautiful and functional home which sits well in the landscape and incorporates many traditional techniques like vaulted ceilings and cloisters. 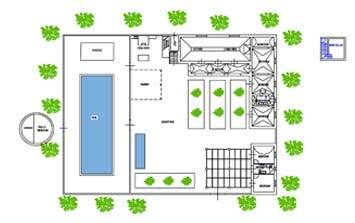 The interior design is new and of high quality. 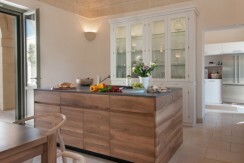 The floors are covered with slabs of Bronzetto di Trani. 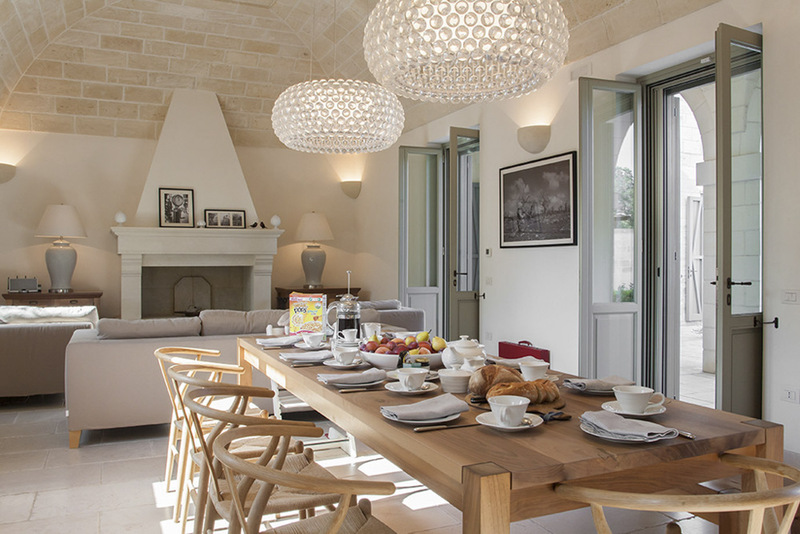 In the dining area the huge oak table is locally made as are the bench and the unusual ‘Wishbone’ chairs and the area is crowned with stunning ‘Caboche’ lamps. 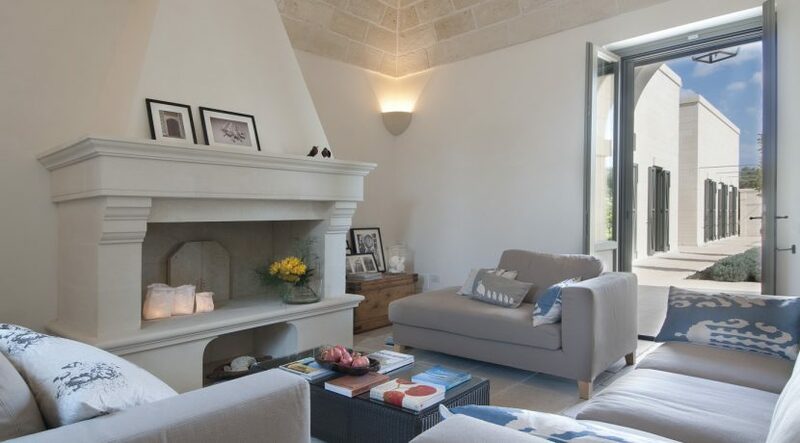 The focal point of the living area is a large fireplace in traditional style with soaring chimney made of local stone and surrounded by three designer sofas in neutral tones. 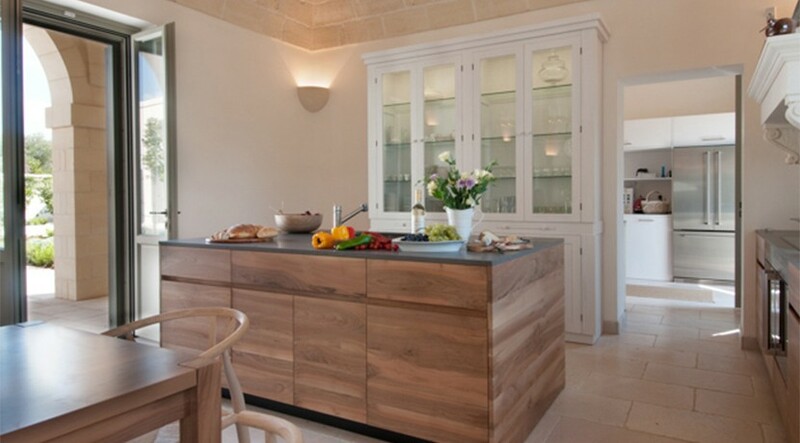 The kitchen is professionally equipped with a large electrical cooker and ample food preparation area and connects to an additional utility and storage room with capacious refrigerator/freezer and cloakroom. 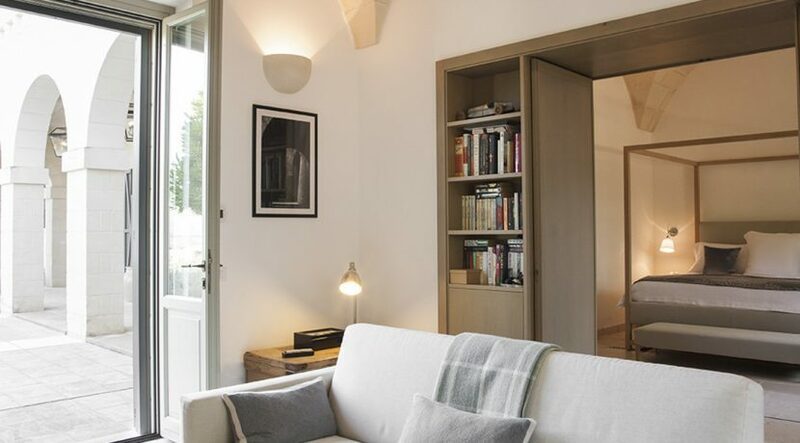 At the right side of the living room is the self-contained sleeping wing. 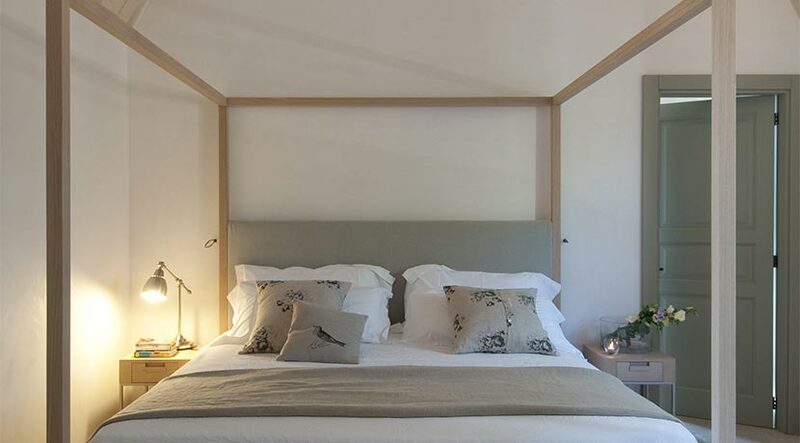 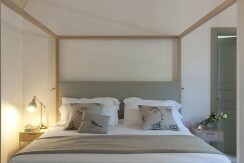 Every bedroom has stylish modern four poster beds and is decorated in calm neutrals to complement the design of the property. 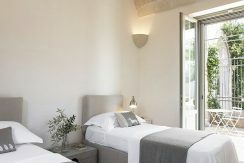 The master bedroom with large en-suite bathroom connects to a studio with a large bookcase, a sofa bed and a lovely fireplace. 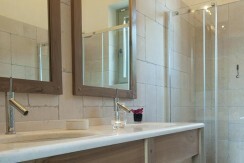 Beyond this lies a further double bedroom with its own shower room. 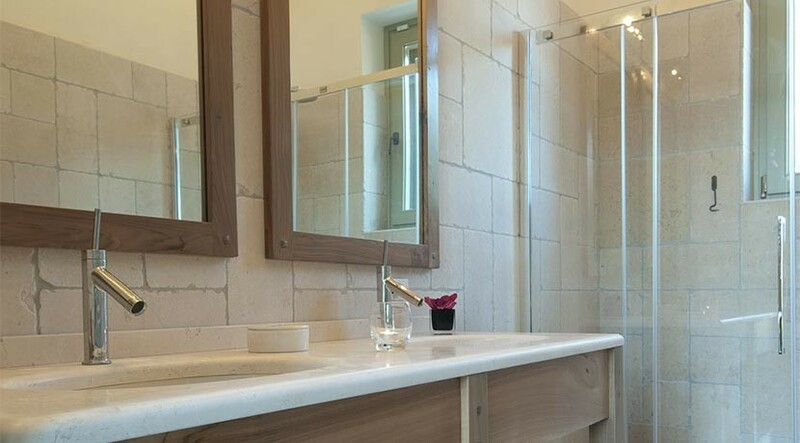 Three metres away from the main house is the annexe consisting of two double bedrooms, both changeable into twin, and a family shower room. 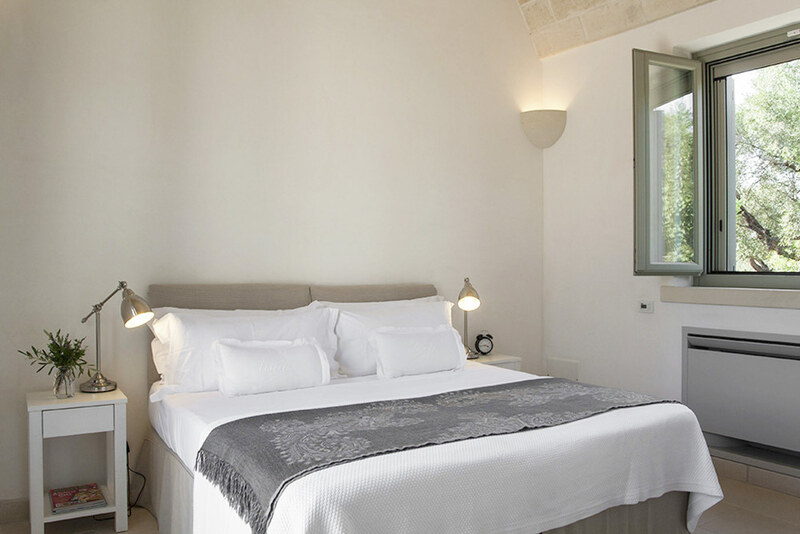 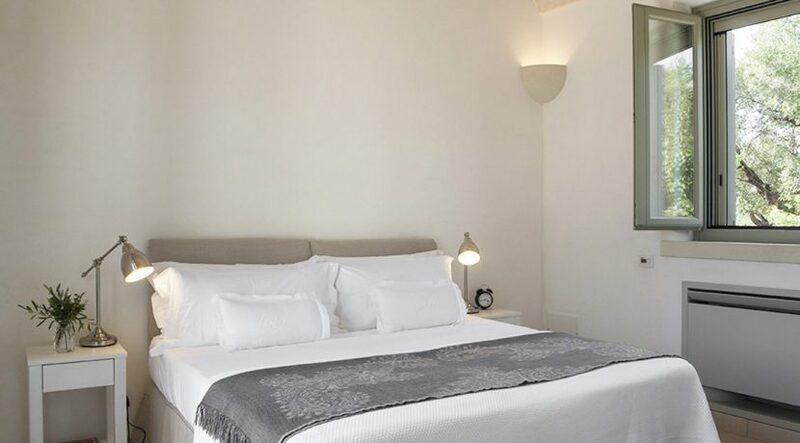 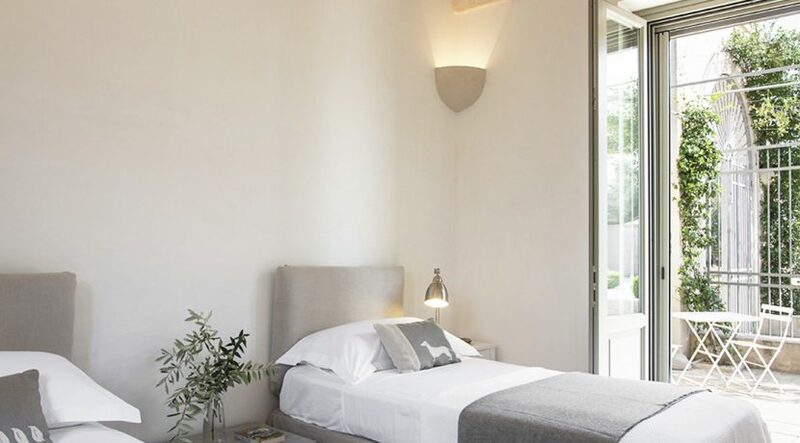 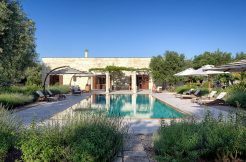 Beyond the vast 20m rectangular infinity pool is another en-suite double bedroom which is the delightful Trullo guesthouse. 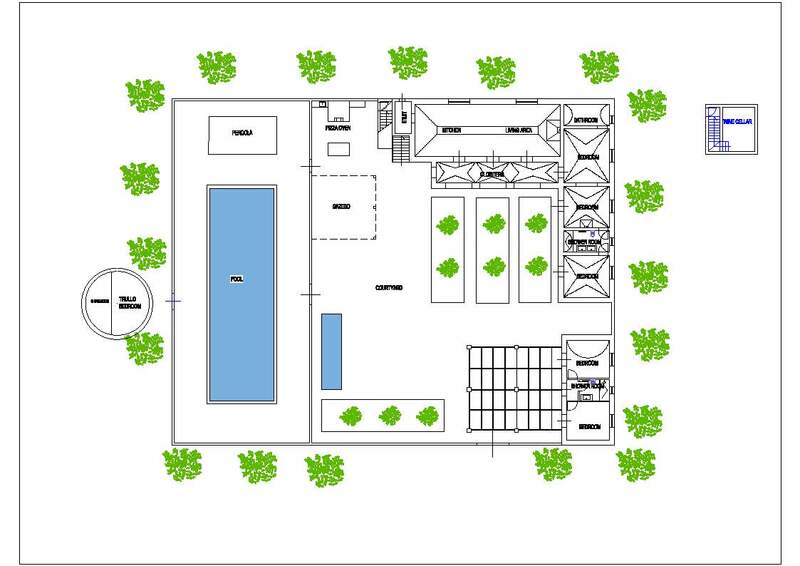 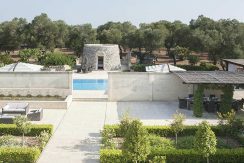 The masseria can accommodate 10/12 people. The walk to the masseria is framed on either side by a pergola of octagonal stone pillars topped by an arched metal frame which supports the Mediterranean climbing plants growing below. A formal water feature with water fed through wall mounted spouts adds the welcome and relaxing sound of running water to the garden. 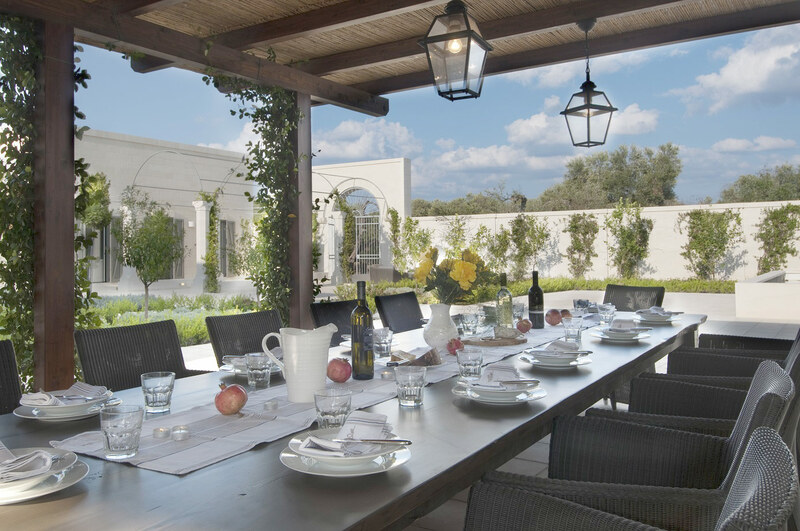 The outdoor dining area has a wood fired pizza oven and a gas BBQ in stainless steel. 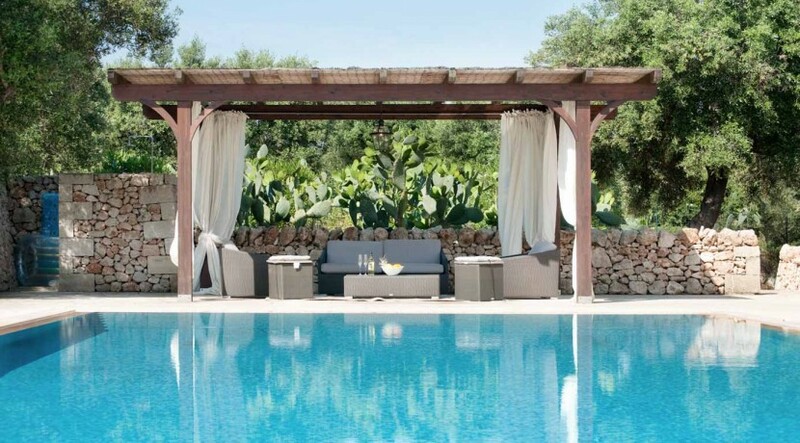 By the pool is another shaded lounge and a hidden outdoor shower. 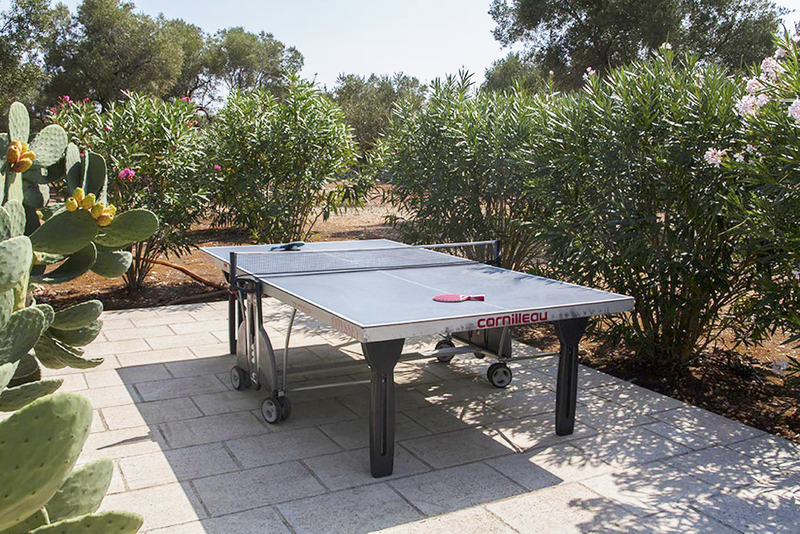 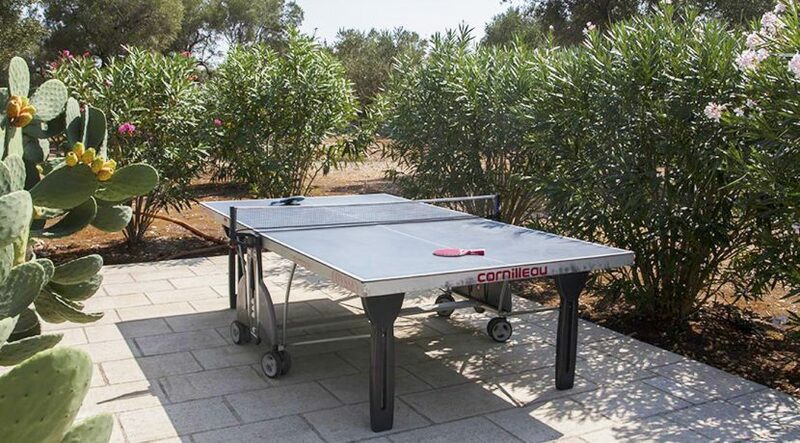 A ping pong table, many pool toys and other children games are available to keep everyone happy. 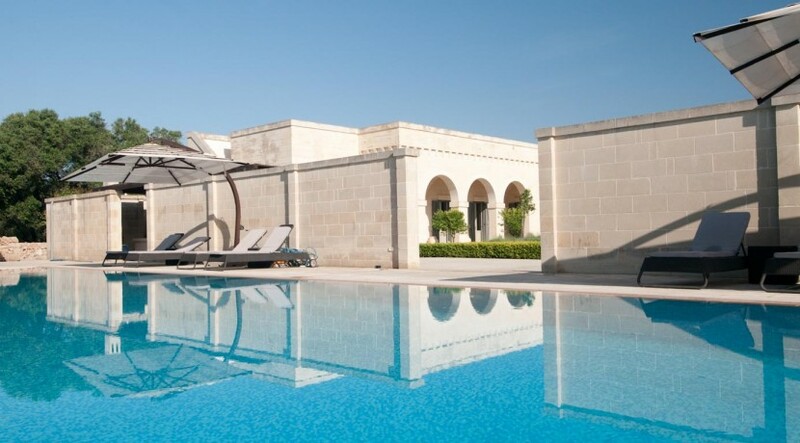 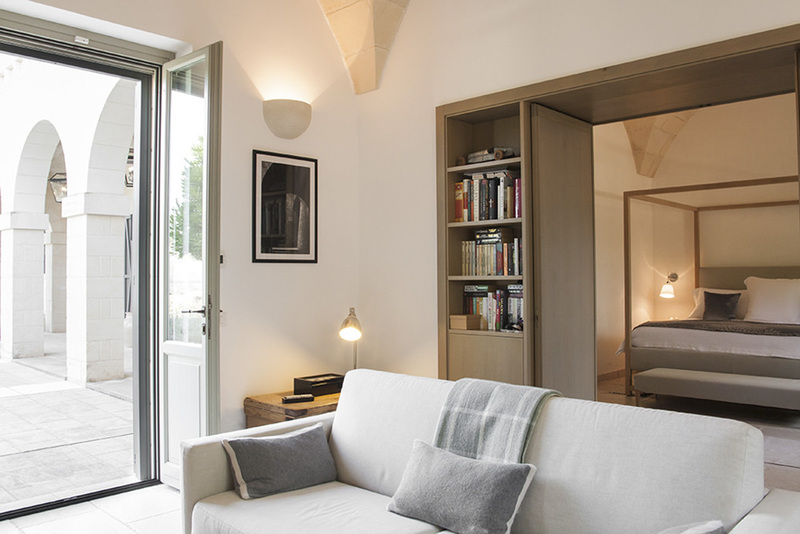 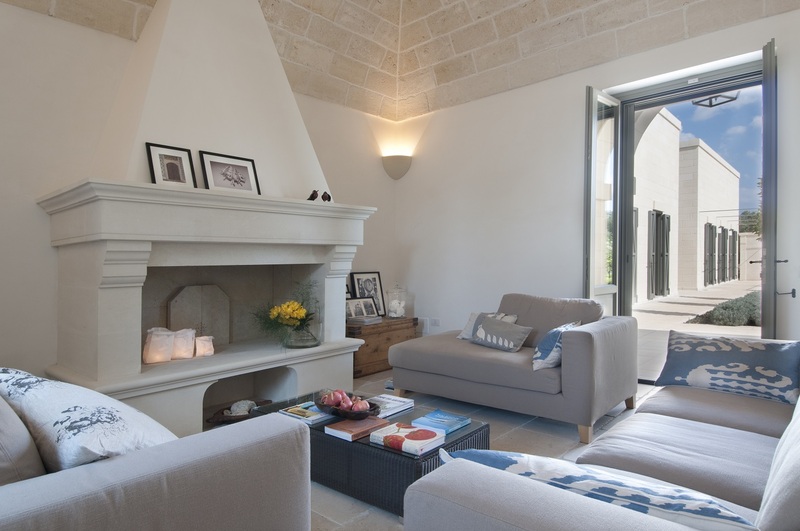 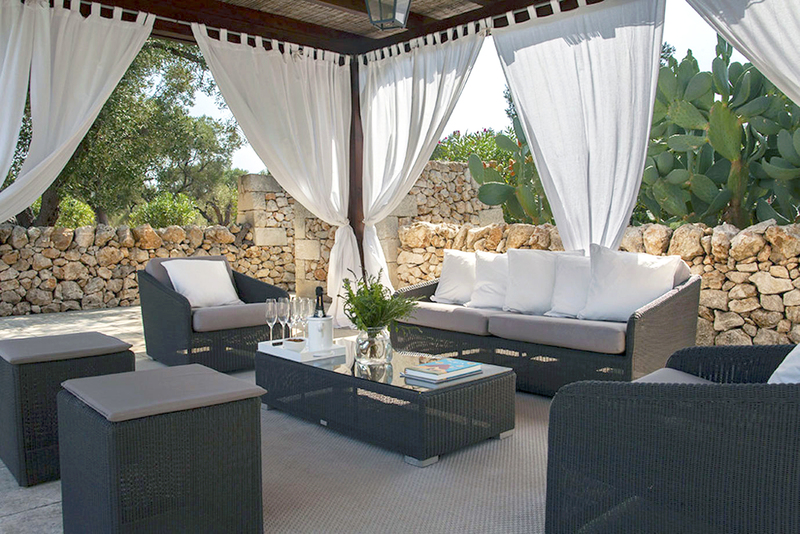 If ever a property was the essence of a luxury holiday villa Puglia – then Masseria Olivina is it.